This food-grade tube box packaging, made of high density cardboard is an ideal choice for your food product packaging solution. Taking a look of the material itself, it uses a well-made cardboard shaped into a perfect tube as for giving the best protection to goods inside. What’s more, it has surface covered with special paper in both interior and exterior side. In the interior part, you can choose aluminium, kraft paper or any other material that is suitable of touching and protecting foods. On the exterior side, a good exterior paper with high grade CMYK printing, very well applied to the outer side of the package, can lead to a decent visual effect that can attract customer’s interest of buying. 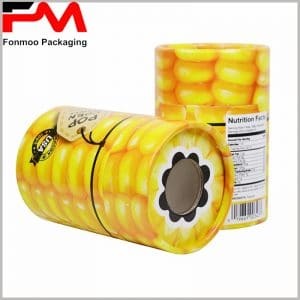 As recently cardboard tube boxes becomes more and more a trend for modern food packaging style, it is greatly recognized by its high performance in ensuring a good protection and giving a comfortable decoration effect. Anyway, as a professional manufacturer of all packages, we will provide you all kinds of good cardboard tube box packaging for food to be customized to fit your needs.